Oliver James questions the utility of the Human Genome Project when it comes to understanding our psychology. What would lead to acceptance of the null hypothesis of the Human Genome Project as regards psychological traits? The hypothesis of the Human Genome Project (HGP) was that differences in DNA sequences would significantly explain why one individual is more likely to possess a trait than another. This has been proven to be true for some physical differences, such as anatomical ones, like height. But, so far, there are no psychological traits – none at all – which have been shown to be significantly influenced by specific variations in DNA (James, 2016). Robert Plomin, the most widely cited authority in this field in the UK, told the Guardian newspaper in 2014 that, as regards psychological traits, ‘I have been looking for these genes for fifteen years and I don’t have any’ (Wilby, 2014). Genome Wide Association (GWA) studies have scanned up to a million sites on the individual genomes of tens of thousands of subjects. Whilst some variant DNA sequences have been established as associated with specific traits and in some cases that has been replicated, they provide negligible heritability: when the effect of the variants is summed all together, they produce heritability estimates of only 1–5 per cent (James, 2014, 2016). It seems highly probable that GWA studies will find no significant role for genes. The only other approach which still holds out hope that DNA directly effects individual differences in psychological traits are gene–environment interaction studies of candidate genes. Studies of epigenetics, junk genes or Genome Wide Complex Trait Analysis (GCTA) do not test the HGP hypothesis because they do not link specific DNA sequences to any specific trait outcomes (James, 2014). Although there have been some promising results in gene-environment studies (Belsky et al., 2009; Rutter, 2014), there have been a great many non-replications. Of 103 gene–environment studies of candidate genes conducted between 2000 and 2009, only 27 per cent of attempts to replicate proved positive (Duncan & Keller, 2013). When the direct impact of candidate genes for a variety of traits was reviewed in 100 GWA studies, very little effect was identified (Siontis, et al., 2010). It is quite possible that the gene–environment hypothesis will never be supported, or only be shown to have a minor influence on psychological outcomes. At first, when the HGP had consistently found trivial or nonexistent heritabilities, the large gulf between those findings and those of twin studies was labelled Missing Heritability (Manolio et al., 2009). The evidence is increasingly suggesting the heritability is not missing; it is non-existent. There have always been grave doubts about the robustness of the twin method (Joseph, 2015; James, 2016). It is possible that twin studies will turn out to have been conflating supposedly high heritability with shared environmental factors. THISE analysis – Twin Studies’ ‘Heritability’ Is Shared Environment – proposes that twin study heritability findings really indicate that for this trait, parents treat their children more similarly (James, 2014). A great deal of what has been assumed to be genetic influence could be the consequence of identical twins being treated more similarly than non-identical twins: the obvious implication of the HGP findings is that the equal environments assumption is false, a proposition which already had considerable evidence to support it before the HGP (Joseph, 2015). At the end of the newspaper interview with Robert Plomin he was asked what he would conclude if the genes he is looking for are never found. Plomin replied: ‘I will still believe that [genetic] heritability is true’. This sounds more like faith than science. Whilst it is impossible to prove a negative, what will be regarded as sufficient evidence that the null hypothesis of the HGP should be accepted? It behoves the likes of Plomin to tell us. In the meantime, the practice of beginning scientific articles with the assertion that such traits as intelligence, ADHD and schizophrenia are ‘highly heritable’, based purely on studies of twins or adoptees, should be ended. This assertion is simply no longer tenable in the light of the HGP findings. Similarly, undergraduate and secondary education courses should cease teaching that any psychological traits are ‘highly’ heritable. At the very least, it should be explained that the HGP findings pose a major challenge to that claim. Read responses to this letter at https://thepsychologist.bps.org.uk/jump-gun-and-you-will-be-shot-down. Belsky, J, Jonassaint, C., Pluess, M. et al. (2009). Vulnerability genes or plasticity genes? Molecular Psychiatry, 14, 746–754. Duncan, L.E. & Keller, M.C. (2011). A critical review of the first 10 years of candidate gene-by-environment interaction research in psychiatry. American Journal of Psychiatry, 168, 1041–1049. James, O.W. (2014). 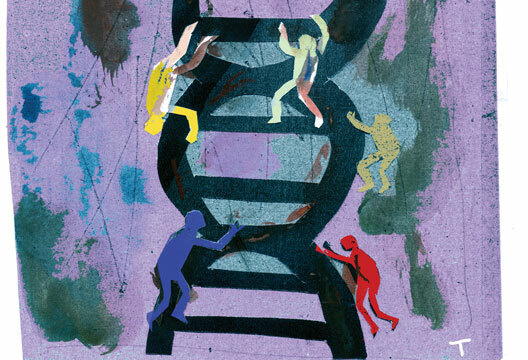 Not in your genes: Time to accept the null hypothesis of the Human Genome Project? Attachment: New Directions in Psychotherapy and Relational Psychoanalysis, 8, 281–296. James, O.W. (2016). Not in your genes: The real reasons you’re like you’re parents. London: Vermilion. Joseph, J. (2015). The trouble with twins. London: Routledge. Manolio, T.A., Collins, F.S., Cox, N.J. et al. (2009). Finding the missing heritability of complex diseases. Nature, 461(7265), 747–753. Rutter, M. (2014). Commentary: G x E in child psychiatry and psychology: A broadening of the scope of enquiry as prompted by Munafò et al. (2014). Journal of Child Psychology and Psychiatry, 55(10), 1102–1104. Siontis, K.C., Patsopoulos, N.A. & Ioannidis, J.P. (2010). Replication of past candidate loci for common diseases and phenotypes in 100 genome-wide association studies. European Journal of Human Genetics, 18, 832–837. Wilby, P. (2014, 18 February). Psychologist on a mission to give every child a learning chip. The Guardian.